Gold Claddagh ring for women features an emerald on each side. 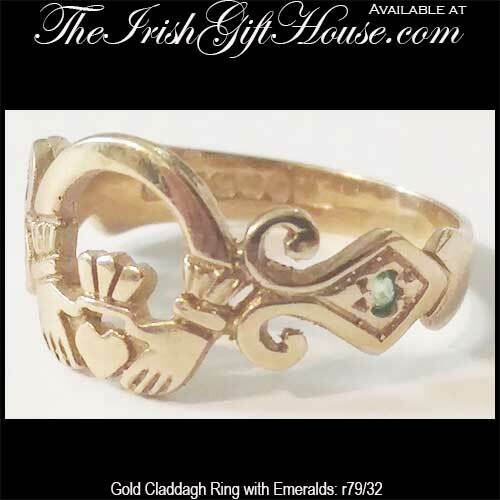 This 10K yellow gold Claddagh ring features a small emerald set on both sides of the Irish symbol. This women's Claddagh ring measures 3/8” tall in the front and it is enhanced with a stylized design on the sides. The emerald Claddagh ring is made by O'Connor Jewelry in Dublin, Ireland and it is gift boxed with a Galway Folklore card that explains how to correctly wear the Irish ring along with a Claddagh history card, complements of The Irish Gift House. Gold Claddagh ring features a 3 stone emerald heart. Gold Claddagh ring features a lab created emerald heart along with genuine diamond accents.